​The Ocotillo Wells SVRA is operated by California State Parks, OHMVR Division, located approximately 1.5hrs drive from San Diego, CA. With more than 85,000 acres and varied types of desert terrain, the Ocotillo Wells SVRA provides interesting and unique opportunities for all types of off-road riders. The western boundary and part of the northern boundary connect with the half-million acre Anza-Borrego Desert State Park, which is closed to off-road recreation, but open to exploration by highway-legal vehicles along established primitive roads. Also referred to as Anza-Borrego Desert, Borrego Springs and by the parks common points of interest including Pole Line Road, Pumpkin Patch, Shell Reef and Blow Sand Hill. Ocotillo Wells SVRA is located between Anza Borrego State Park on the west and the Salton Sea on the east. Ironwoods Rental is located directly across 78 from the Ocotillo Wells SVRA OHV Park Entrance. A short drive from neighboring Imperial Valley, San Diego and Palm Springs. Proceed east on I-10 to Palm Springs, south on 86 to to the 78 west. Proceed east on I-8 and take the 79 north to the 78 east. ​Vehicle repair shops, telephones, groceries, hotels, motels, RV parks, and restaurants are available in the surrounding communities of Borrego Springs, Ocotillo Wells, and Salton City. Fuel is available in the communities of Borrego Springs and Salton City. No fees are collected for camping or day use. 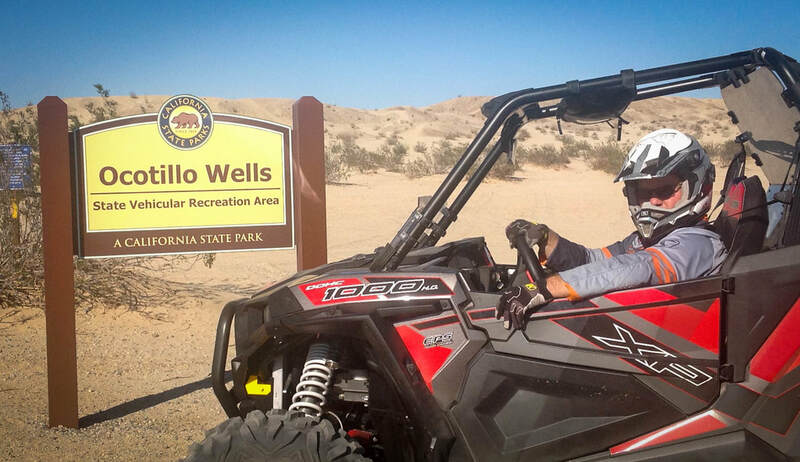 Ocotillo Wells is open seven days a week, 24 hours a day. Open camping is available throughout the park for up to 30 days per calendar year. Camping is not permitted at Shell Reef, Devils Slide, Blowsand Hill, The Notches, or 4X4 Training areas. There is limited camping East of Poleline Road. If you are in a self-contained vehicle with holding tanks, fill your tanks before you arrive—water filling stations are not available. Also, the park does not have a dump station for your waste water disposal. Vault restrooms and limited shade ramadas are located in the Quarry, Cove, Main Street, Holly Road, and Hidden Valley areas. Pay showers are available on Ranger Station Road, on Main Street, and in Homes Camp. The showers now accept quarters. One quarter provides 2 minutes of hot water; four quarters provides 8 minutes of hot water. Quarters are available at the Discovery Center. Note: Pricing could change. Note: Desert Ironwoods Resort offers potable water and dump station facilities locally for a service fee. Destination Polaris made a visit to the Salton Sea area including Ocotillo Wells a few years ago showcasing some of the unique history in the area and how off-road enthusiasts enjoy the valley. Salton City is located just outside of the SVRA to the north on the Salton Sea, the largest lake in California and a one time beach resort destination.